A regular burrito for $4.76? Or a large for $5.71? I can understand $4.99 or $5.75, but 71 cents? Why that odd number. Thank you so much random Cambridge burrito store! No more need for exact change to be an exact annoyance. Now if I could only remember your name, I could praise you right. They’ve got half dozen or more stores in boston/cambridge. 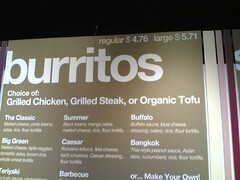 Personally I still find their burritos to be rather, well, uninspired.